For years my family has been making this recipe for pickles. 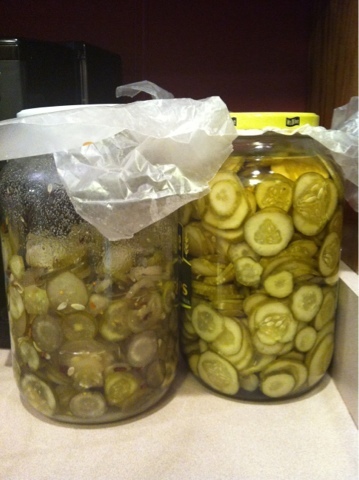 Both of my Nannie's who are now gone from us, made these pickles. My Mom always makes these pickles and now we make them. They are a sweet pickle. My favorite way to use them is in chicken salad. Another good way is potato salad. Have them as a side dish, along with a big bowl of pinto beans. Yum! 2. Drain well, rinse for 3 washings, add 2 tablespoons alum and enough water to cover. Let stand for 24 hours. 3. Drain and rinse for 3 washings. Cover with cider vinegar and let stand for 10 days shaking daily. 4. Drain and pour vinegar out. 5. A:Mix 2 tablespoons pickling spice, 2 cups sugar over pickles and shake to dissolve. C: Next day after add 1 1/2 cups sugar and shake til dissolved. that was almost 9 cups sugar total on the last 3 days). I had to add the You're done as Step 5 & 6. That was what my Nannie's handwritten recipe said. Isn't it the cutest? It makes me smile. I hope you give them a try and the recipe makes it through your generations like it has ours! These sound like great pickles, I can't wait to add these go my pickling list this year. Thanks so much for sharing them. This is Kathy from the other mountain. I just started these pickles today. I was wondering how you store these pickles. Can you can them or keep them in the fridge or shelf? Thanks ahead of time!!!! Hi Kathy. We process these in a hot water bath for about 15 minutes, just to get a good seal. I hope that helps! I have been looking for this recipe for years! My great-grandma used to make them and as a kid I could eat an entire jar in one sitting! Hi! I was almost in a panic! I lost my recipe for the shaker pickles and finally shot up a prayer and stumbled? across your sight again! We loved them last year even though sweet pickles aren't my favorite normally, these are now!... but this fun to make recipe and so crisp and yummy. Thank you for sharing this reipe.